Sunday’s snow mostly was gone by Monday, but we got another load later in the week. The weather system was difficult to forecast. 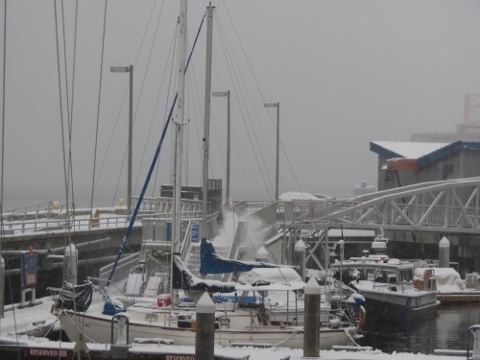 Although the snowfall was less than the record originally anticipated, enough still fell to keep anyone off the roads who didn’t need to be out. And we got an unusual freezing rain event. The combination knocked out power for many folks on the Eastside. 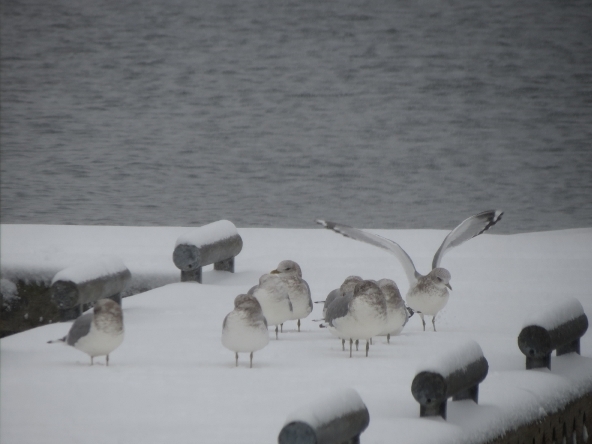 The past few day’s below-freezing temperatures have eased off now, and the snow is melting. But conditions still are pretty bad on many city streets, with power still out for a number of Eastside residents. 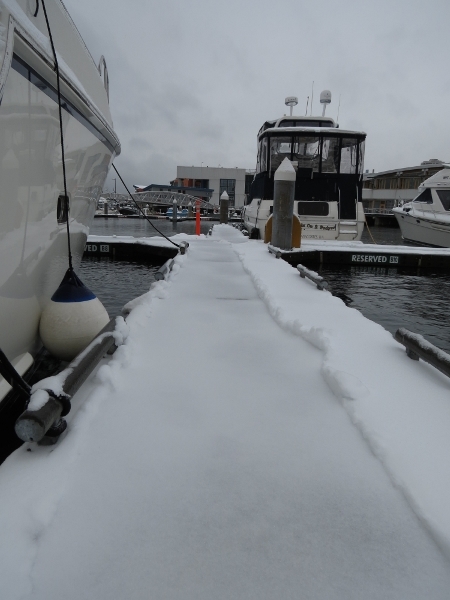 Below are a couple of images taken from our boat at Bell Harbor Marina. 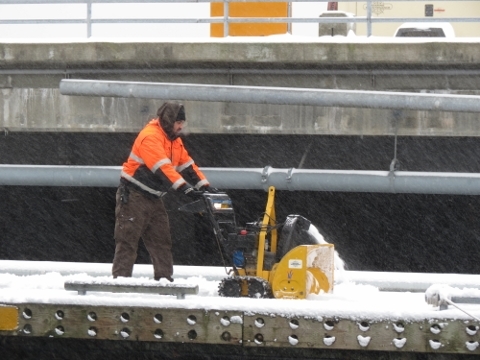 On the left someone is using a leaf blower to clear the ramp, and we actually had enough to warrant using a snow blower on the docks. 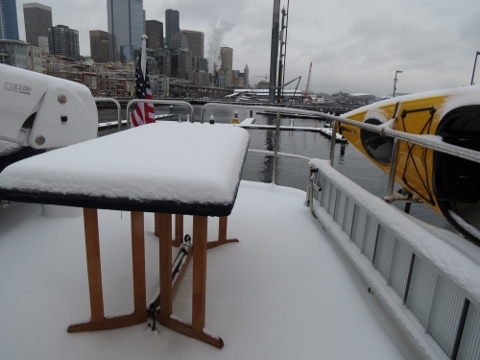 We had several inches piled on our decks. 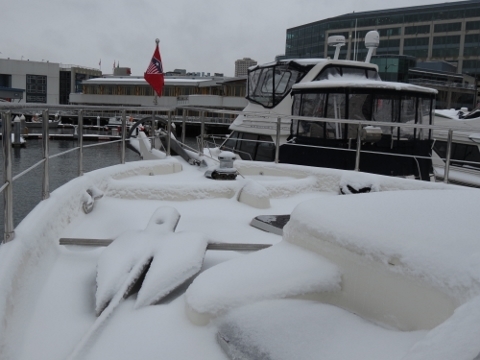 When building the boat, we added extra insulation above the overhead panels to improve heating efficiency for high-latitude cruising. 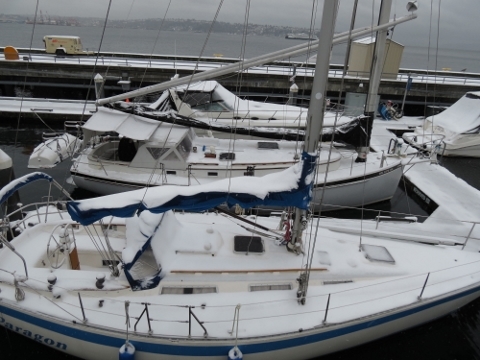 Judging by the lack of snowmelt on our decks, given we keep the boat 72F inside, the insulation is working. 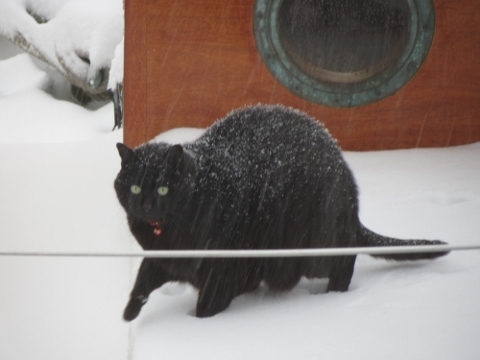 Novik from Skol checked out the snow for a bit. 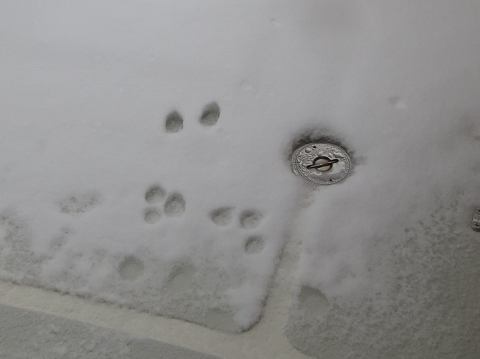 Spitfire left a few prints, but generally wasn’t impressed. 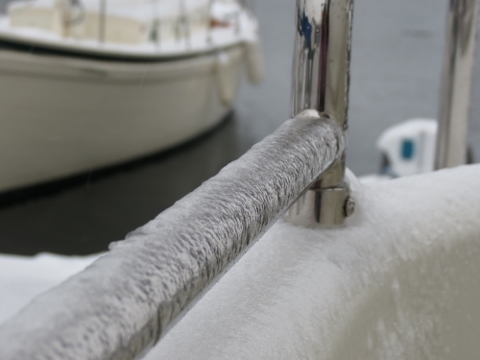 The freezing rain coated our our rails in ice. 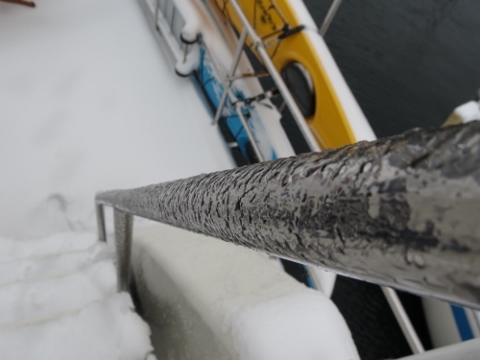 The last time we remember seeing our deck rails frozen like that was several years back when saltwater froze on our rails and decks. After the freezing rain, the snow was like a hardshell candy: a solid crust on the outside, with soft and fluffy snow on the inside. 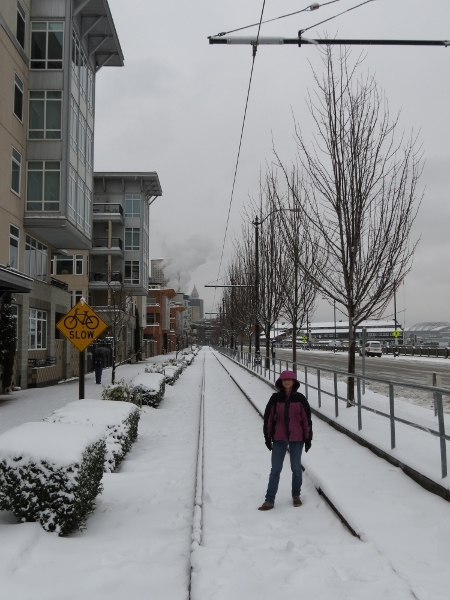 By Thursday, the snow path cleared on Wednesday was starting to fill in. 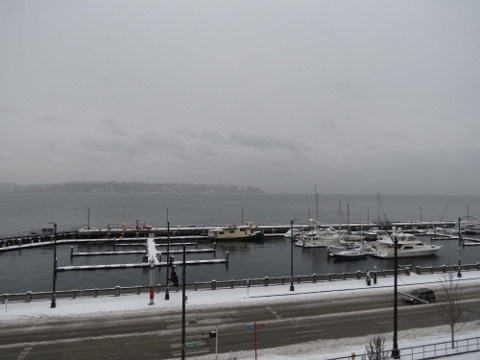 The picture on the right below is taken along the old waterfront streetcar tracks across the road from the marina. 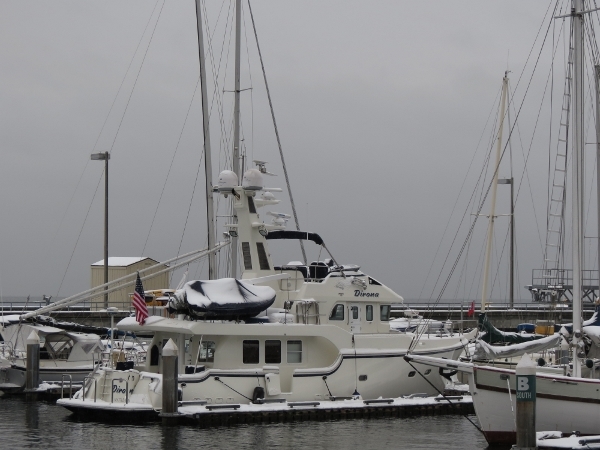 Lots of marina space. 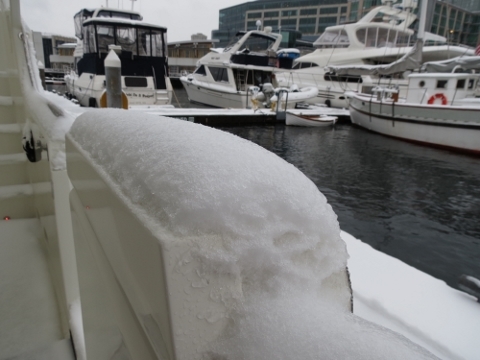 Even in the winter, it’s unusual for the guest dock to be completely empty near the weekend. 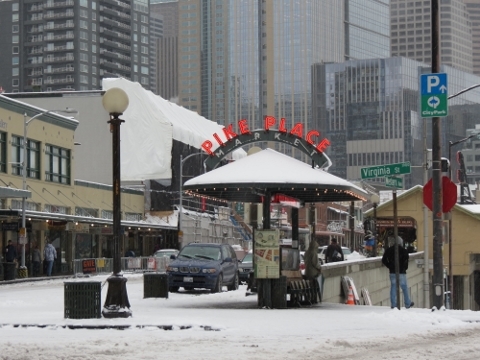 Downtown Seattle was pretty quiet on Thursday. Some of the steeper roads were blocked for traffic. Many businesses were closed, and few cars or people were about. 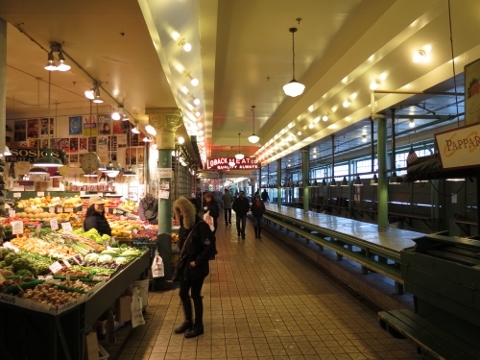 Pike Place Market was open, but unusually quiet, with a handful of vendors open and not many customers.